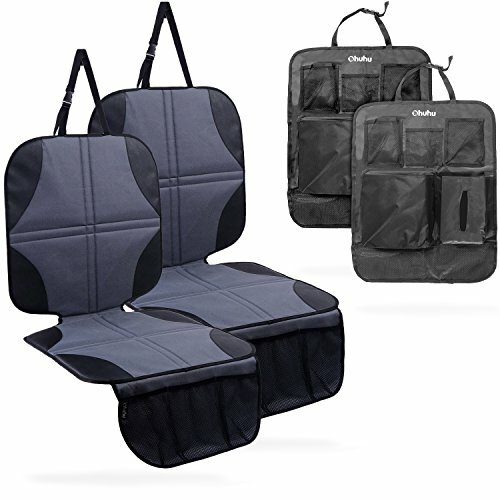 The Ohuhu 2-Pack Car Seat Protector protects your car seats and car upholstery with added convenience. The durable, easy to clean mat works with both forward-facing and rear-facing seats. It has been constructed with high-quality fabrics, which have built in dual grip traction technology to prevent skidding and secure seat into place. The waterproof mat protects your seat and car from spills and messes. While the added mesh allows for easy and convenient storage of snacks, toys, drinks, bottles, wipes and more. This mat is built to work in any type of car with any type of baby seat, and has been crash tested for optimal performance. ❤ 2 Packs Car Seat Covers With Mesh Pockets: Double sided anti slip grip on the seat and textured dual grip traction technology grips on both sides to keep your baby seat safe. Handy mesh pockets are for quick and organized access to toys, snacks, drinks, bottles, wipes etc.